Flat design fits close to fireplace opening. This screen offers the same features as our G-3830 model, including a graphite finish, but it is larger in size. 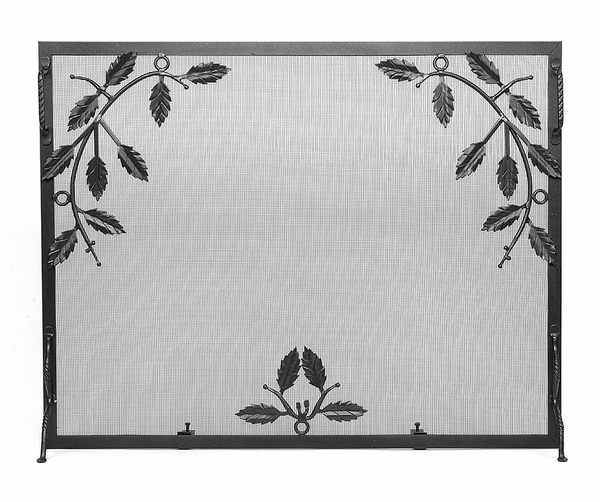 The Minuteman G-4433 Weston Fireplace Screen's dimensions are 44 x 33 inches. You'll like the durable, classy looking graphite finish. You'll also like the adjustable feet (to make sure it stands straight) and the distinctive leaves and berries design. The look is completed by rope twist designs on the handles and front feet. Get a fireplace screen that accentuates your home's style and doesn't detract from it! Increase your home's safety beautifully! Do the leaves stick out from the face of the screen or are they embedded into the face/front of screen? Per the manufacturer, the leaves are supported by metal eyelets that are welded to the perimeter surround. In order to clear the surround edges, the leaves stand approximately 3/8 of an inch in front of the mesh screen material.